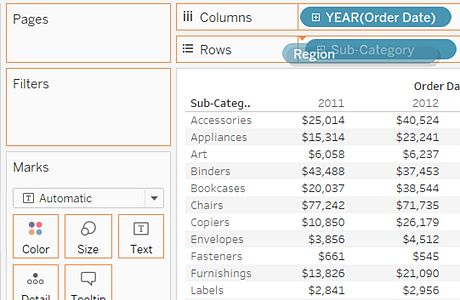 In Tableau, you typically create text tables (also called cross-tabs or pivot tables) by placing one dimension on the Rows shelf and another dimension on the Columns shelf. You then complete the view by dragging one or more measures to Text on the Marks card. A text table uses the text mark type. Tableau chooses this mark type automatically if the view is constructed using only dimensions (assuming the Mark type is set to Automatic). 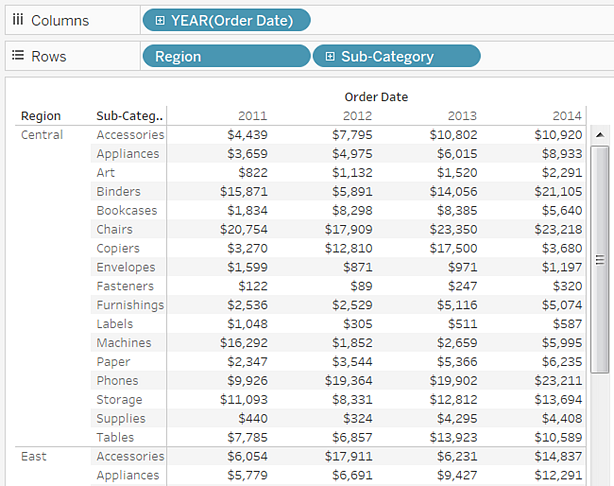 The following exercise walks you through creating a text table that shows sales totals by year and category. 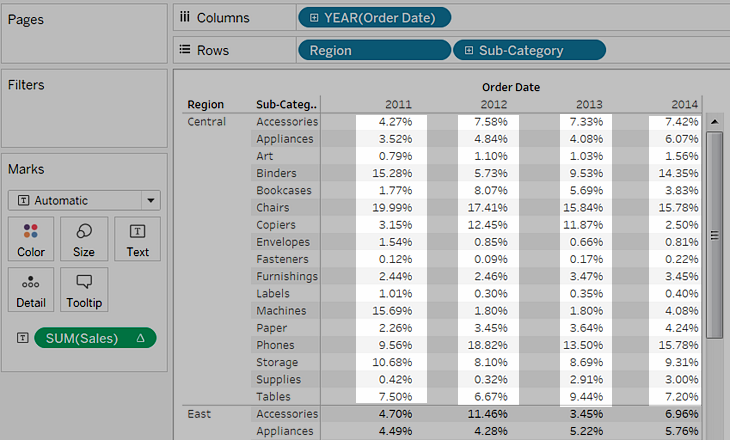 Connect to the Sample - Superstore - English (Extract) data source, which is included with Tableau Desktop. 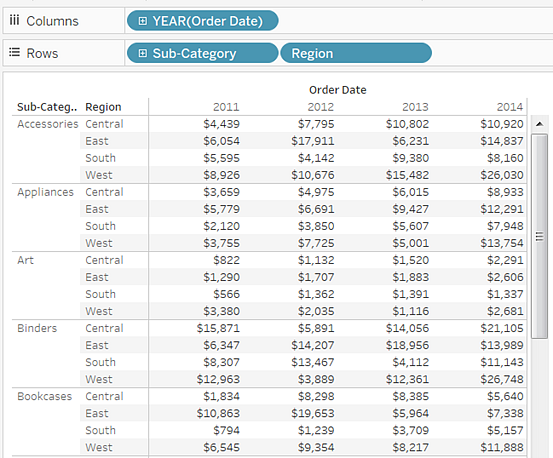 Drag the Order Date dimension to Columns. The date is automatically aggregated by year, and column headers are created. 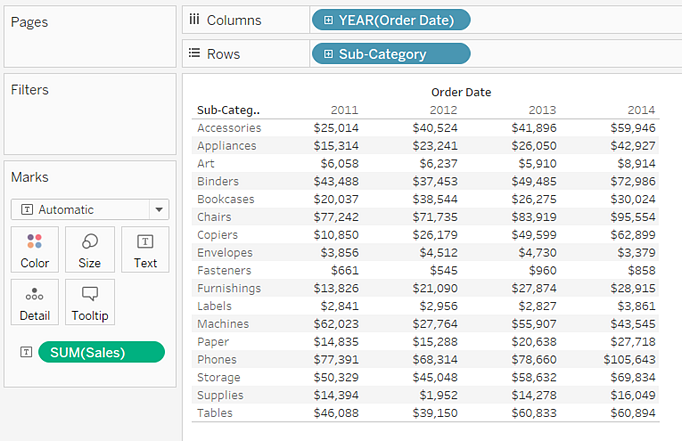 Drag the Category dimension to Rows. Row headers are created. Columns with headers plus rows with headers means that a valid table structure now exists. You must now add a measure to the view to see actual data (that is, numbers). Drag the Sales measure to Text on the Marks card. 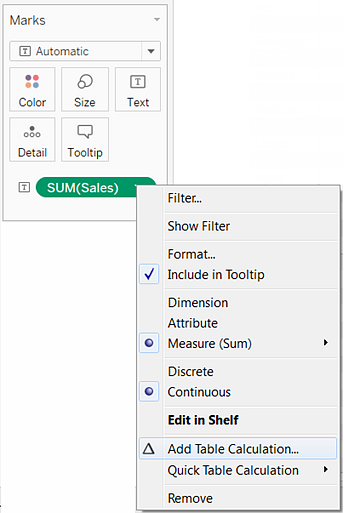 Tableau automatically uses text as the mark type. 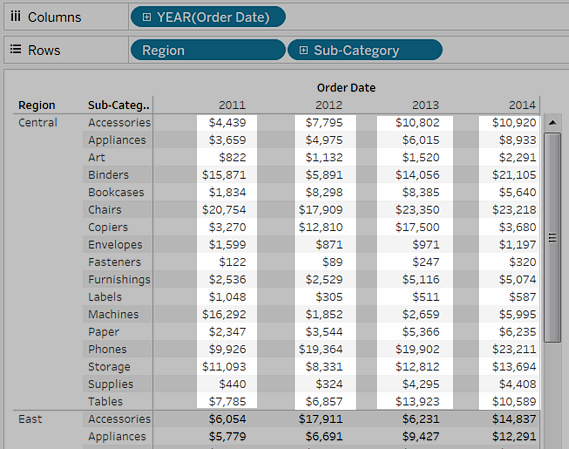 Each cell in the table displays the sum of the sales for a particular year and category. We can see that Office Machines had the highest sales in every year but one. The dimensions that you use to frame your calculation are called the addressing fields, and the fields (in this case a single field) in which you run your calculation are the partition fields. For more on these concepts, see Addressing and Partitioning. In the Table Calculation dialog box, set Calculation Type to Percent of Total. 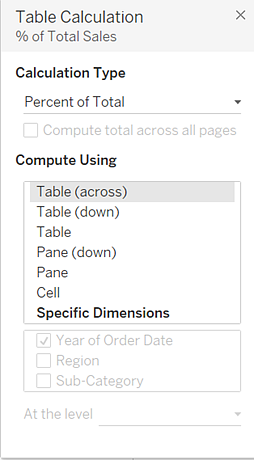 For more information on the options in the Table Calculation dialog box, see Using Table Calculations in the Tableau knowledge base. Choose Pane (Down), and then click OK to close the Table Calculation dialog box. Pane (Down) is the correct choice because it specifies that the calculation should be performed from top to bottom within each pane of the table. The table has two vertical dimensions, so Table (Down) would have calculated the percent of total from top to bottom for the entire table, ignoring the Continent dimension. The pane is always the finest level of detail for the relevant direction (across or down). If you had three dimensions on the vertical axis, you might have had to use field names to define the calculation, since only the dimension furthest to the left on the Rows shelf (defined as Table) and the dimension furthest to the right (defined as Pane) could be captured with the structural options. If you find these concepts daunting, you're not alone. It's not inappropriate to use trial-and-error to see the results of different definitions for table calculations. But you should have a clear idea of what result you want, so that you can recognize it when you see it.